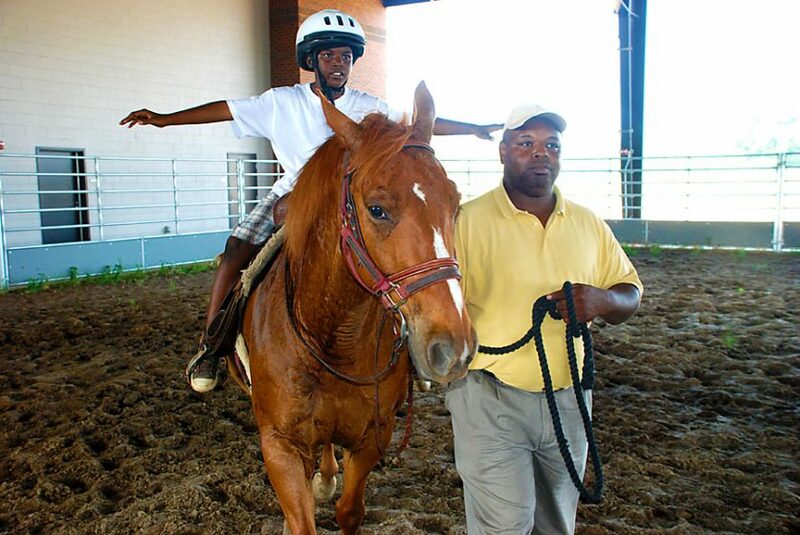 The Center offers free riding and horse-care lessons to FVSU students. A series of five classification levels, with additional privileges and challenges for the completion of each level, gives students goals to meet as they achieve success in their equestrian endeavors. As students progress through the levels they have the opportunity to reach their peers what they have learned. Volunteer opportunities are also available for FVSU students who need volunteer hours. They can teach children about horses and learn firsthand about horse safety. Training is provided for those students with little or no experience. The Center is surrounded by acres of pasture and includes a nine-stall barn, a large outdoor arena and a covered arena. There are various props available for setting patterns within the arenas including barrels, cones and jumps. In addition, there are miles of trails on and around the Fort Valley State campus, which permits a variety of riding experiences, particularly for advanced riders.